This particular photo I liked because the pattern on the quilt square is much like the pattern of the stone foundation. The last two years or so I’ve been running into more and more barns with the quilt squares on them. I feel like I’ve missed the memo. I shoot a lot of rural photos and am usually somewhat “up” on rural goings on. But the quilt squares completely escape me. It’s as if every owner of rural property with traditional barns or outbuildings received a memo telling them to put a quilt square like pattern on their buildings. Does anyone know what started this? I think it’s kind of cool, but want the back story. 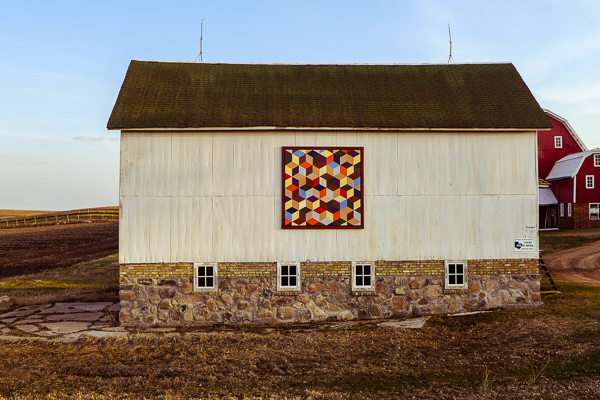 This entry was posted in Uncategorized and tagged buildings, copyright ryan ware, family farm, out buildings, quilt barn, quilt square. Bookmark the permalink. I think this started in Iowa and moved north in recent years to Minnesota. I believe Houston County has a barn quilt tour. This type of art is becoming more and more common. Right now, in my drafts, I have a blog post ready to publish of a quilt on an outbuilding near Faribault. This building and the quilt are stunning as is your photo. Where is this located? It’s on the outskirts of Chaska. If you look left from it you see new homes in developments; if you look right you see fields and farms. It is exactly on the edge of what will be and what was.